1. There is no OCA exam any more for Java 11. But you can think of the OCPJD part 1 (1z0-815) to be in the same position as the old 808 exam (minus the OCA cert). Here is another feedback on OCP Java 11 1Z0-815 exam. BTW, a member on OCP Java 11 Certification Whatsapp Group received a confirmation email from Oracle saying that it is indeed a valid path. If you have an OCA 6, 7, or 8 certification, you can go for the OCP 11 Part II i.e. 1Z0-816 exam. Our records indicate that you have earned your Oracle Certified Associate, Java SE 8 Programmer credential with the Testing Id ****. Kindly note that candidates who hold the OCA Java SE 8 can upgrade to OCP, Java SE 11 Developer credential by passing the exam 1Z0-816. This information will be updated on our website (https://education.oracle.com/oracle-certification-exams-list) soon. Today I passed OCPJP exam with 86%. I passed OCAJP with 90% in October,2018. OCPJP is much tougher than OCAJP. There are many new topics like functional programming, stream, NIO2. As I don't have much working knowledge with Java 8, therefore it took longer time for preparation. I have followed OCP study guide by Jeanne Boyarsky and Scott SelikoffMy. This is a great book for learning and preparing. After going through Jeanne's book, I have completed all the chapter tests and mock test given the book. I have given all the Enthuware mock test. I repeated some tests. I have reviewed all the questions after each mock test, updated my note. Then reviewed my note. Real exam question was not much easier than mock test. Rather it was much closer to mock test. Got bunch of stream questions. Thanks Jeanne Boyarsky and Scott SelikoffMy for great book. Thanks Enthuware for great product. Ahmed Ibrahim wrote: also for this point i would ask what's the reason that there is no associate level for Java 11 anymore ? , Is the associate certification not valuable in a resume when applying for a junior job ? 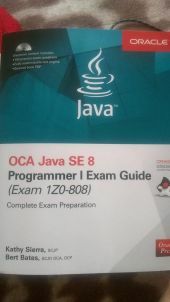 "I am Java SE 8/7/6 OCA" -> "1Z0-816"
It seems that people with OCA can earn OCP 11 by taking only one exam. Could you confirm that Jeanne? Yes, this path is very useful to candidates who have spent time and money getting the OCA 7/8. They can straight away go for the OCP 11 i.e. 1z0-816 exam. I hope it is not a mistake in their FAQ because there was no OCA 6.